So back in August I wrote this post in which I discussed how I was going to start posting more. Well after I wrote the post I had some misgivings about adding the short posts to my main page and then the whole idea fizzled out. Then a few weeks ago I started to think about it again and found a new method that I think I’m happy with. 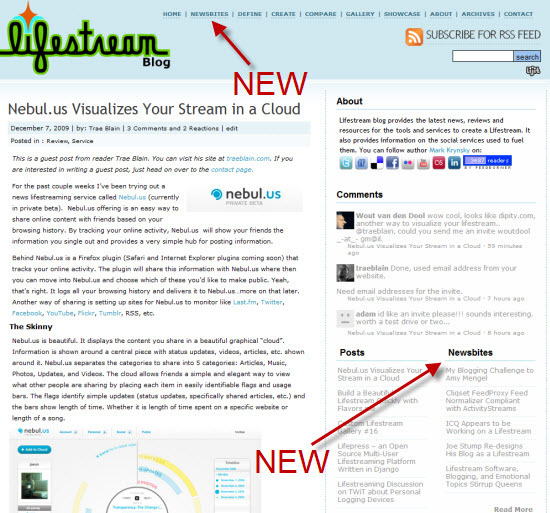 I’ve decided to create a Newsbites section (and sidebar widget) which will now house all of the shorter posts that I will be creating. In most cases these are just the sites I already bookmark on Delicious and have accumulated 500 over the last 3 years. My reason for doing this is so that I can also add images, some commentary, but also so that it is all archived and searchable here on Lifestream Blog and not a 3rd party site. I’m only doing this moving forward but may go back into those archives on Delicious and find items worth reposting here. At first I was going to also split off the RSS feed but then decided against it. I didn’t think people would want that since they could filter my regular posts by visiting the home page. I am open to your thoughts and suggestions on this though so let me know if you feel otherwise. I will say that making this changes to WordPress was a bit of a hassle and required some PHP hacks and as always if anyone is interested I can share what I did so you don’t have to go through all the trouble. It also makes me appreciate the benefits of using a true CMS like Drupal. 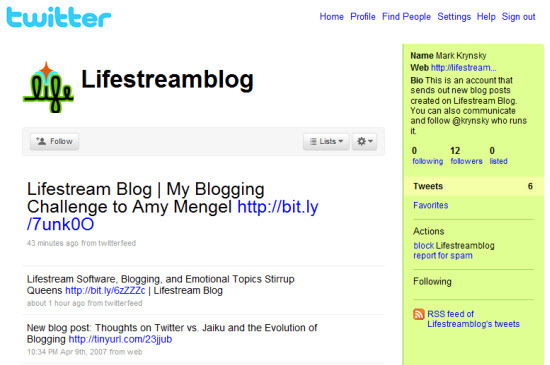 Along with that I’ve also decided to rekindle the Lifestream Blog Twitter account. I created the account shortly after creating the site but then opted to let it die and just manage the blog through my personal account. Well for now all I’m doing is piping my RSS feed through it but for those of you that prefer to get your news & feeds (or just supplement your other methods) by using Twitter, well then go ahead and follow it. But if you want to communicate with me then do so on my personal account. I also made some other minor enhancements to the site but have plans for adding some more sections and building out existing ones further. Look for quite a few changes over the next several weeks. If you have any thoughts on things you’d like to see or new functionality let me know as well. I continue to do this for all the great readers of Lifestream Blog. Thank you all very much for helping inspire me to continue to bring you the coverage. Very cool stuff Mark ! I like what you've been doing on your lifestream site. I've followed you for awhile and have incorporated many of your ideas and guidance in my sites. If you get a chance check me out at INFOtainment News (http://www.infotainmentnews.net) and THE Tech Scoop (http://www.thetechscoop.net). I'd love to get your feedback on my efforts.